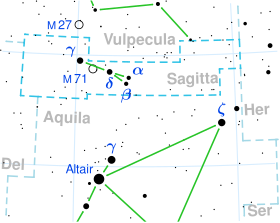 Alpha Sagittae, also named Sham, is a single star in the northern constellation of Sagitta. Alpha Sagittae is the Bayer designation, which is latinized from α Sagittae and abbreviated Alpha Sge or α Sge. It is visible to the naked eye as a yellow-hued star with an apparent visual magnitude of +4.39. Despite the name, this is not the brightest star in the constellation – that distinction belongs to Gamma Sagittae. Based upon parallax measurements, Alpha Sagittae is approximately 382 light-years from the Sun. It is moving further away from the Earth with a heliocentric radial velocity of 1.7 km/s. This is an evolved bright giant with a stellar classification of G1 II. It is 151 million years old with 4 times the mass of the Sun and has expanded to around 21 times the Sun's radius. It is radiating 340 times the Sun's luminosity from its enlarged photosphere at an effective temperature of 5,333 K. There is an X-ray source within 6995581776417331444♠12″ of these coordinates. This star bore the traditional name Sham (or Alsahm), which derives from the Arabic word سهم sahm, meaning "arrow", the name formerly having been applied to the whole constellation. In 2016, the International Astronomical Union organized a Working Group on Star Names (WGSN) to catalogue and standardize proper names for stars. The WGSN approved the name Sham for this star on 12 September 2016 and it is now so included in the List of IAU-approved Star Names. In Chinese, 左旗 (Zuǒ Qí), meaning Left Flag, refers to an asterism consisting of Alpha Sagittae, Beta Sagittae, Delta Sagittae, Zeta Sagittae, Gamma Sagittae, 13 Sagittae, 11 Sagittae, 14 Sagittae and Rho Aquilae. Consequently, the Chinese name for Alpha Sagittae itself is 左旗一 (Zuǒ Qí yī, English: the First Star of Left Flag). ^ a b Soubiran, C.; Bienaymé, O.; Mishenina, T. V.; Kovtyukh, V. V. (2008). "Vertical distribution of Galactic disk stars. IV. AMR and AVR from clump giants". Astronomy and Astrophysics. 480: 91. arXiv:0712.1370. Bibcode:2008A&A...480...91S. doi:10.1051/0004-6361:20078788. ^ Kovtyukh, V. V.; Gorlova, N. I.; Belik, S. I. (2012). "Accurate luminosities from the oxygen λ7771-4 Å triplet and the fundamental parameters of F-G supergiants". Monthly Notices of the Royal Astronomical Society. 423 (4): 3268. arXiv:1204.4115. Bibcode:2012MNRAS.423.3268K. doi:10.1111/j.1365-2966.2012.21117.x. ^ a b c d Takeda, Yoichi; Sato, Bun'ei; Murata, Daisuke (2008). "Stellar Parameters and Elemental Abundances of Late-G Giants". Publications of the Astronomical Society of Japan. 60 (4): 781. arXiv:0805.2434. Bibcode:2008PASJ...60..781T. doi:10.1093/pasj/60.4.781. ^ a b van Belle, G. T.; et al. (2009). "Supergiant temperatures and linear radii from near-infrared interferometry". Monthly Notices of the Royal Astronomical Society. 394 (4): 1925. arXiv:0811.4239. Bibcode:2009MNRAS.394.1925V. doi:10.1111/j.1365-2966.2008.14146.x. ^ Böhm-Vitense, Erika (November 2004), "Rotation and Lithium Surface Abundances, Revisited", The Astronomical Journal, 128 (5): 2435−2442, Bibcode:2004AJ....128.2435B, doi:10.1086/425053. ^ "5 Sge". SIMBAD. Centre de données astronomiques de Strasbourg. Retrieved 2019-03-30. ^ Greiner, J.; Richter, G. A. (March 2015). "Optical counterparts of ROSAT X-ray sources in two selected fields at low vs. high Galactic latitudes". Astronomy & Astrophysics. 575: 67. arXiv:1408.5529. Bibcode:2015A&A...575A..42G. doi:10.1051/0004-6361/201322844. A42.